Christians gather over three days to hear, enter and receive the eternal gift of Christ. The people of God experience themselves as a meal community. We hear about the last loving meal Jesus had with his disciples before his arrest. So it is that over the centuries most Christian have shared a meal at their weekly meeting. The Three Days begins with this meal. On Friday each one will receive a stone holding it in their hand, placing their worries on it, feeling its weight. At the end of the service each may leave their stone at the foot of the cross: leaving behind their worries; letting go of the weight; marking an encounter with God; and honoring Jesus in his time spent in the grave until Easter morning. Come to hear, enter and receive the eternal gift of Christ. Grace will join this journey at the Wednesday Lenten Sharing Dinner & Discussion. These are not the soup suppers and worship services of past years. The Wednesday Lenten Sharing, Dinner & Discussion will be held at Wernecke Grace House 6-7p. There will be small dinner groups with guided discussions of Luke’s story of the road to Emmaus (Lk 24:13-34). All ages are welcome (and wanted). On March 13th we’ll share stories of times our journeys have been interrupted. Did hopelessness overwhelm? On March 20th we’ll share stories of times when we real-ized our point of view proved to be partial. Did something unstick us to see in a new way? On March 27th we’ll share stories of how our own pre-ferred outcome kept us from recognizing God at work. On April 3rd we’ll share stories of our own blindness, of times when we realized there were voices we never heard or considered. On April 10th we’ll share our community stories of times when hospitality only meant friendli-ness. How is invitation also hospitality? Grace is small enough to care. These Wednesday Lenten “Sharing, Dinner & Discussion” will draw members together in deeper faith and friendships. My Grandpa and Grandma Schmidt spoke German of a sort. Their German was a mashup of German, Russian and the languages spoken in Eaton, Colorado by other farmers and members of their church. There were times that Grandma would be telling Grandpa some-thing and he would laugh and say “No mama, that’s not how you say that.” Their language was disappearing even between the two of them. Language has to be used and reimagined for every generation or it will become extinct like my grandparent’s language has. In Galatians Paul introduces a reimagined language about God’s appearance in our lives using the fruits of the Spirit. Remember the list, love, joy, peace, patience, kindness, good-ness, faithfulness, gentleness, and self-control? This language would not have made sense to God’s people a thousand years earlier because they imagined God as a master that had to be obeyed. God’s appearance in their lives meant submission, duty and obligation. Was one right and one wrong? No, the language had to be transformed for a vastly different culture. Since we believe in a creating, dynamic God we don’t need to be afraid of receiving treasures from the past and reimagining or transforming them for our time. The Missional River hasn’t completed the focus groups yet but a common response sparked this article. Members in different groups have expressed a longing to have relationships that would help form (what I call) a vocabulary of faith. These relationships would create confidence in speaking about faith with others. No matter the size of a congregation shouldn’t members be prepared there to speak about their faith outside of the church walls? Is the vocabulary of faith becoming extinct? Do we have conversations outside of church using words like grace, wisdom or how about the fruits of the Spirit? It is these conversations that will keep our language alive. There have been studies about just that. 71% of Americans say they are “religious”. That can mean very different things but we’ll stick with 71%. Of that percentage 7% say they have “faith conversations” outside of church. That means that of everyone at worship at Grace less than 3 people mention their faith Monday- Saturday. Do you speak Latin? Within my lifetime our vocabulary of faith will go the way of Latin. It was once used throughout the culture then just in worship services and now? There is a silver lining, comeback languages. Two of these languages that were almost extinct and are coming back because people decided that they are important and need to flourish are Hawaiian and Gaelic. These languages are being reimagined for the current times. Would you join me in experimenting about how to feel at ease using our beloved vocabulary in daily life? I think it will mean gathering in small groups to hear the language and fall in love with it again in anticipation of it entering our lives. I don’t want to see it disappear never to be heard outside rituals that are heard by so few on Sundays. Let’s turn the Christian language into a comeback language. November can feel like the race has begun. Hurry, spend, rush, Christmas is coming! We can’t do anything about what the consumer culture pushes in our faces but we have the power to create a life of thankfulness in-stead of endless want. We have the power to decide how we spend our time, money and imagination. I offer you an option to hungering for more stuff. Fill your life with a hunger for justice, mercy and thankfulness. My nephew’s family puts up a paper thankful tree on a kitchen wall this month. Each day dad, mom and kids add a leaf with something they are thankful for that day. Do you see what this simple activity does? It opens our eyes to the gifts God gives every day. It is a choice to see your day as a gift. Does that surprise you? Yes, when we decide to live trusting that God is with us we are using our power to stand against the consumer culture. The other gift this activity gives is abundance. Too often the only time we hear our family speak about thankfulness is a quick minute around the Thanksgiving table. By adding a thankful leaf every day everyone in the family hears about the abundance around them. We have the power to create a life of thankfulness. There is another side of thanksgiving that is harder. Can we be moved by the fact that we are provided for, and that we are so well off in comparison to others, that we recognize our responsibility to share? This other side of thanksgiving can help fill our lives with a hunger for justice and mercy. To share what we have; and always make an effort to make sure that the world’s resources are shared fairly is the other side of thanksgiving. Jesus did this in his ministry. Remember the times he fed a huge crowd? It was such a memorable event that three of the gospels tell the same story. His followers were convinced that there was not enough. Jesus takes what was given and blesses it and shares it. Surprisingly it not only fed all the people but there was some left over too. Let’s use our power to create lives of thankfulness instead of endless want. There is a great blessing in being “given” and essential value in “sharing”. These are the two sides of Thanksgiving. May each day shine with God’s love for you! Worship attendance has tumbled over the past years from an average of 76 in 2011 to 63 in 2016 to 52 last year. None of the four Sundays in September have reached an attendance of 40! What happened? Where are members on Sunday mornings? Did something change at Grace that sent them away? The Pew Research Center is a nonpartisan fact tank that informs the public about the issues, attitudes and trends shaping America. It conducts public opinion polling and demographic research. Their recent research on “Why Americans go (and don’t go) to religious services” might help our conversation here. More than four in ten Christians who do not attend services regularly say they practice their faith in other ways. The next two reasons for not attending are that they haven’t found a church they like and no reason in particular. Across all religious groups, large majorities cite desire to grow closer to God as key reason for attending religious services. The survey reports the eight in ten attenders say they “always” or “often” experience a sense of God’s presence when they attend worship. Nearly three quarters say they “always” or “often” feel a sense of community with people and six in ten say they feel a sense of connection to a longstanding tradition. These results don’t vary across age groups. Maybe the Pew Center survey will push our conversation toward the key reason given for attending worship. How does Grace’s worship nurture growth closer to God? Can we listen to stories of desire? How can Grace meet this desire in people? So there are my three ideas that I hope are a beginning of a larger conversation. The Missional River Team has begun such a conversation and awaits your thoughts from the survey. We arrange our lives around how we answer this question, How does God work? How is God present in the world, my world? When God is a judge who is watching to catch us doing wrong our lives can feel worthless without a chance of that changing. When God is abstract our lives are our own because God is immaterial. When God is at church our lives are separated into boxes that we can move be-tween yet keep closed off from one another. When God is our own conscience we live self-justified. Throughout the fall worship services we will ask this question, how does God work? We will hear stories that are ancient yet reveal new under-standings about our lives. How does God work? God works through promises. God makes promises and keeps promises. Listen to the stories of Noah, Abraham and Sarah. What does it look like when God keeps a promise? Listen to Joseph in prison. Listen to the songs and praise of a dry footed people. We worship a God who creates relationships. God’s promises create relationships. An invitation is delivered to enter this life expanded by God’s presence in it. We meet a God who is not watching to punish or something abstract or boxed in or as small as our conscience. This invitation to a relationship with God unlocks our lives to join this colossal creation. Our lives become more than we can hope or imagine within God’s circle. We are blessed to be a blessing wherever we go. Yes, you can believe that, we are blessed to give God’s love in service to our neighbor. We become promise wherever we go. Come and see, come to receive, come and dwell in promises that trans-form. Grace is beginning a new ministry this month. The council agreed to join a ministry of our larger church, the ELCA. Raising up and training people for pastoral leadership requires the effort of congregations as well as Synods and seminaries. Pastor Cindy will be an Internship Supervisor. The intern is entering a formation experience, not just acquiring new skills but participating in God’s work to form a pastor uniquely fitted for Kingdom service. Katie Wegner will begin a yearlong internship at Hutto Lutheran this month. Pastoral training includes three years of class work and one year of contextual experience. 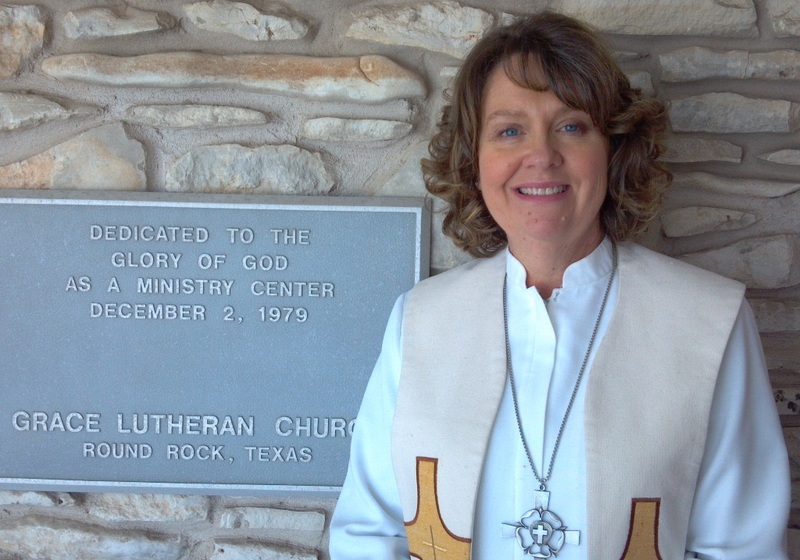 Katie has completed her class work through Luther Seminary while working at Immanuel Lutheran in Pflugerville. 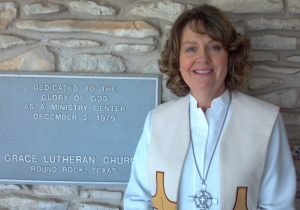 She will be leaving Immanuel to be the pastoral presence at Hutto Lutheran. Her ministry will include areas such as administration, leadership development, stewardship, worship, ecumenism, teaching, caring for the sick and sharing in the ministries of the people there. Pastor Cindy will be mentoring her throughout the year. This will take Pastor’s time and attention. Early in August (7th-9th) she’ll attend the Supervisor Training at Luther Seminary in St. Paul, MN. There will also be a weekly meeting with Vicar Katie to discuss academic, theological, and practical questions. Both of them will be attending regional gatherings of interns and supervisors for additional support and education. Pastor will attend some meetings at Hutto to help the intern get her feet under her. Vicar Katie will attend a few of Grace’s council meetings getting another view of congregational leadership. A few times during the year Pastor will preach at Hutto and Vicar Katie will preach at Grace. This new ministry offers Grace opportunities to get to know a sister congregation. The year will be enriched by members and committees entering this formation experience with Hutto watching for God to work in us. Integrity/honor involves consistency between words and actions. When we follow through with the commitments that we have made, it shows integrity. When we say one thing and do another, it creates conflict. We generally do not like to live with the contradiction, so we become experts in spin control. Initially we may cringe at what we have said or done, but we go on to tell ourselves and others that it really was okay. It might have appeared to be a contradiction, but with a few tweaks to the storyline, we can show that we were right all along. In worship this month the series on 1 John provides language that has often been used in liturgy. It speaks of the contradiction between saying that we have fellowship with God, and yet live in ways that contradict that relationship. The text declares, “God is light and in him there is no darkness at all.” It names the tendency for kidding ourselves about ourselves in these words of confession, “If we say that we have no sin, we deceive ourselves, and the truth is not in us.” The writer says that acknowledging the problem is the first step toward moving beyond it. Things become more specific in later chapters, which speak of the contradiction between saying we love God, while conveying a lack of love by what we say and do. Forgiveness is the mending of relationships. The basic idea is release. It is the point at which one can be honest about the damage that has been done, while saying that what has happened does not determine the future. What a glorious promise is given in 1 John, “God who is faithful and just will forgive us our sins and cleanse us from all unrighteousness.” Forgiveness is the moment when a future that has been blocked by something that has damaged relationship is opened up by the word that offers release for new relationship. How can the 10 Commandments have different numbers at other churches? What? What’s the 3rd commandment? Is it Keep the Sabath or do not misuse God’s name? Correct, it is both. What? There are 3 ways of dividing and numbering the Ten Commandments. Luther does it one way in the Catechism, other Protestants do it another and the Jewish numbering is different again. For years there was a plaque hanging above the drinking fountain at church that listed the commandments, just not from the Catechism. Do you know the commandments? Does it matter that we mix and match without noticing? Be at June worship services for a 4 week series on the 10 Commandments. Their numbering isn’t the most important thing. Building our lives on how God creates interlinking relationships is the most important. Maybe you think those are Old Testament laws and I don’t have to bother with them. Or you think they are just a list of “DON”T DO IT”. This series will surprise you with how all your relationships can be improved, how your life can have more love and kindness in it and how God knows boundaries are a blessing in our lives. Do you remember writing letters? Not the alphabet letters that make up words. I mean letters sent through the mail, written correspondence. There must be one or two generations at this point that have never seen such a thing, like a dial phone attached to the wall. My grandmother and mother sent me letters every week I was at Seminary. Their letters would begin with a prayer of blessing for the faith that we shared along with a bible verse. Then I would hear the family news, weather report and a review of their daily chores. They would conclude with a benediction for me and my work at school. 1000 miles away their letters reconnected me to who I was. How do we connect and bless each other today? Is it important that we support each other today? Do we want church members involved in our lives outside of church? The early church (60 years after Jesus ascended) was sustained through letters. The church at Philippi had learned that Paul was under guard through a letter and had sent money and a member to care for him. We have Paul’s reply to them in the New Testament book of Philippians. “I thank my God every time I remember you, constantly praying with joy in every one of my prayers for all of you.” (Philippians 1:3-4) These ancient words are a model for Grace. The Missional River program describes an idea from Marc Dunkelman in The Vanishing Neighbor that our relationships had been impacted by the digital revolution. Dunkelman uses the image of the planet Saturn as he describes our relational rings. The most intimate relationships are those people who form the innermost ring. The middle ring included friends, church and neighbors. In recent times the innermost ring has expanded. This means the time focused on family has grown and relationships with neighbors and the larger community is reduced. This has a direct impact on the church. The church is in the ring that has been reduced. The connections that “just happened” a generation ago must be intentional or they don’t exist. The congregation’s role in the lives of members is disappearing. People are here less and their connection disappears. People that come here have a harder time connecting with groups that have long histories. So they disappear too. Deepening relationships with one another will require seeing new opportunities. So I repeat my earlier questions; How do we connect and bless each other today? Is it important that we support each other today? Do we want church members involved in our lives outside of church? Letters would reach through those “rings” to sustain relationships in times past. They would bring blessing and comfort as well as encouragement. It can be disheartening to consider the task at hand but we have been blessed by an old, old letter. These are the two principles that will bring new excitement to Grace this year. They are the two wheels on the cart. These two responses came up over and over on the January vitality survey. The council has made enriching relationships with God and one another and sharing our faith with others as the focus for our minis-tries throughout the year. This month you will be hearing from the council about their dedication to Grace and to bringing excitement for all we do here. You will see how our ministries are enriching relationships and sharing faith. You will be invited to see your participation in this ministry in new ways. There will be a living sign of this in our own front yard! Sometimes we fail to see how separate events come together to support the whole. It is time to see in new ways. Let me give you some examples of separate events coming together. In the past month the Missional River Team at-tended the first learning seminar; we had a clean-up day and gathered in a special Lenten offering. The Missional River seminar begins the yearlong process of listening for God in our-selves, our congregation and community, all to enrich relationships overflowing for others. Even annual events like the clean-up are times to get to know each other in new ways. The Lenten offering for the Fund for Leaders gave us a chance to hear from seminary students preparing for ministry. This month there are brand new events to keep the cart rolling. The Free Little Library has already sparked excitement within the congregation. On April 8 we will join to bless in new ministry that will literally share Grace with our neighborhood. The graduation party on April 29 will give us time to celebrate as well as have fun looking back at our own graduation. Add the potluck meal and a great time will be had by all. Bibles will be given to the graduates. To make the Bible a personal gift from their faithful family at Grace we will have a chance to high-light or underline texts that are meaningful to us. All of these events can be seen as something else on the calendar OR you can jump in and expect God to make something new of you and Grace. The cart is rolling. There have been many stories shared at the midweek Lenten services. During March we will hear from Mary, Paul and Lydia. Each story asks, what is God’s will? Is that a question you’ve asked in your prayers or during times when you could only shake your head and wonder? How can stories from ages ago help us recognize God’s will for me? We often speak about passing the faith onto the next generation. Although I know what is meant behind those words I don’t believe faith can be passed on, like blue eyes or an inheritance. If one generation’s faith could become the next generation’s faith church pews would be full. No, I don’t believe faith is passed on, it is demonstrated or modeled. The best model of faith is one that struggles. This demonstrates that faith isn’t a once and for all statement. Author Brian McLaren teaches that too often we see the bible as the constitution (a legal document) rather than a conversation. I guess that is what I’m trying to say, that faith is a lifelong conversation that shocks, disrupts, comforts and guides us. Faith is shaped with each day’s experience. This is what we pass on, our own conversation with faith, with bible, with God’s will. What is God’s will? As we listen to the stories from Mary, Paul and Lydia we discover there is no one will for all of us. Stories from the past as well as stories from our family and friends will reveal God’s life in us. Sharing those stories of how we see God today in our lives is the only way we can pass on faith that is alive and authentic to those around us. Come hear the stories from the past and begin to see God’s story in your life. What About Chocolate Hearts and Playful Tricks? Sometimes the irony of our calendars helps us re-consider how our different ways of keeping time intersect. We live by a Christian cycle throughout the year and the American cultural calendar. You’ve likely noticed that in 2018, Ash Wednesday falls on Feb. 14. I’ve already seen some Facebook chatter about what a downer this is. How can we feast on chocolate hearts and go out to Valentine’s Day dinner while also being reminded that we are dust and to dust we shall return? Yet isn’t that cross on our foreheads a symbol of love, a sign of our baptism as beloved children of God? Can we use the opportunity to talk about the new hearts created in us, hearts turned toward telling the truth of the limits of human love and relationships? Then, as the season of Lent comes to a close, we celebrate the Resurrection of our Lord on April fool’s Day (April 1). Though not a public holiday overloaded with the commercial and cultural weight of Valentine’s Day, it’s still a bit ironic that Jesus surprises us on this day associated with foolishness. What we think is foolishness is indeed the greatest wisdom of all: Christ’s life springing from death; Christ’s undying love abounding for the whole creation. We are likely filling up our calendars for this calendar year. As we do so, let’s remember that God’s time. The gift of the Christian year is to root us in kairos, biblical time, rather than chronos, or clock time. It is a counter-cultural idea that our time, like our lives, revolve around Christ. As the Lutheran author, Gail Ramshaw writes, “Each week begins in the joy of the resurrection. Each year is renewed by Christ at Easter.” May we enter this Lenten season with hearts opened, ready to receive love abounding. We all agree: Advent is about preparation and waiting. Of course, the gift of Christmas is a gift worth waiting for! It’s about preparing for the hope that is coming, but it’s also about noticing all the hope that is available right here, right now. The Bible texts we will hear this month are not about easy or idealistic gift giving. These scripture selections take us seriously and want us to have a real engagement with hope, not a sweet, sentimentalized encounter with it. And real hope, as we know, requires traveling to some dark and challenging places. They take us first to Daniel’s fiery furnace. They then lead us into Ezekiel’s boneyard. After that we head over to Isaiah’s gang of hopeless exiles. This call to hope exposes the necessity of hope being joined to something greater, something we can’t purchase and wrap. It is at those moments in life when we realize there is nothing we can do to secure the future that hoping in God’s faithfulness joins us to a new future. This promised future isn’t lit by an artificial twinkling light concoction it is moving through darkness toward four simple words, “Do not be afraid”. In Daniel 3 Shadrach, Meshach and Abednego hope in God’s faithfulness not knowing how it would come. Ezekiel is surrounded by bones yet speaks God’s future into that graveyard hoping, for what? Exiles all they hope God will give them their true identity. Our hope in God is that our true identity isn’t consumer but God’s child. Our hope in God frees us from that fear that we are not enough and fills us beyond our imagining with Christmas gifts worth waiting for! As you gather this Thanksgiving here are a few suggestions to help everyone offer something they are thankful for this year. When you’re asked to say what you’re grateful for at the Thanksgiving table do you name people, jobs, or sources of security? Is it harder to name God, perhaps because you aren’t sure how to express what you feel? Try offering your thanksgiving to God by thinking about God as Father, Son and Holy Spirit. Being grateful that God has created, redeemed, and sustained us is an easy place to start. Talk about the gifts of God known in each person of the Trinity: a loving parent, a friend who walks by our side, a spirit working within us, calling us into be the child God sees. Another suggestion is to have a variety of table prayers to share. Here are a few you might want to use. As each prayer is offered ask what does this prayer bring to mind? Are there words that evoke images that you like? Have you used it before? Who shared this prayer with you that you are thankful for now? May your tables be filled with thankful hearts and grateful spirits! October 29 Grace will mark the 500th anniversary of the Reformation. A special 9:15 hour of fun and learning for all ages together is planned! The worship service will be special with additions of music, art and reflections. Then a potluck dinner will be served for all to enjoy food and fellowship. Mark your calendars and plan on being at Grace for this special Sunday morning! The Reformation directly impacted church and society. Luther helped bring the faith into the daily lives of people. He translated the Bible and liturgy into the common language. He wrote the Small Catechism to bring the faith into homes where parents would be the primary teachers. The Reformation message emphasized God’s power of forgiveness that frees you to love God and neighbor. This 500th observance is not to look back at an event that is over but calls us to live the message of the Reformation in the present. The power of God’s Word to save and transform lives is as important today as in Luther’s time. This ongoing Reformation provides opportunities to reflect on how this good news continues to impact our lives of faith. The Small Catechism is to be used for conversation and prayer. Why don’t you try starting such a conversation by asking “What was your first memory of attending a Lutheran congregation?” Luther wrote “A Christian is a perfectly free lord of all, subject to none. A Christian is a perfectly dutiful servant of all, subject to all.” What does it mean to be free and at the same time committed to serve others? “For by grace you have been saved through faith, and this is not your own doing; it is the gift of God.” Ephesians 2:8. Can you name a gift you received and have not forgotten? Who gave it to you and why? Beginning September 10 the stories we hear in worship will follow a new lectionary (cycle of Scripture readings). The “Narrative Lectionary” takes us through the great stories (narratives) of the Bible. We have heard some of these stories before but they are often snippets of the story included with three other readings each Sunday. Now we will hear longer narratives that help us see Scripture as a story that has consistency and movement. • From September to mid-December the preaching texts begin with the early chapters of Genesis, move through the stories of Israel’s early history, the exodus, the kings, prophets, exile and return. • From Christmas to Easter there is sustained reading of one of the gospel of John. • From Easter to Pentecost the texts are chosen from Acts and Paul’s letters. The biggest change will be that only one piece of Scripture will be read in worship. This is so we can focus on the breadth of these great stories. We begin with Old Testament stories which mean we won’t be reading a Gospel text. Some may feel without a Gospel reading Jesus isn’t in worship. Let me assure you that Jesus is present in the great stories of the Old Testament as the very breath of God. We will continue to gather around the table every week where Jesus is the host and we hear His words of promise, “Take and eat. Take and drink.” I believe hearing and learning these Old Testament stories will invigorate our understanding of the Gospels. I invite you to enter the narrative of God’s living Word in a new way beginning September 10. • The verb “to believe” means “to give your heart to.” Belief comes from your whole self and not just your mind. • Belief is not a list of things you know for certain; it’s much richer than that and also more elusive. Belief always carries within it the seed of doubt. It sounds as if the answer to the opening question isn’t a list of memorized ideas or what you’ve heard someone else say. Doesn’t it begin to sound like belief is active? Belief begins to look like a person’s whole life. Maybe our question about belief can be seen in our lives, if we pay attention. Belief isn’t something that is “done” once and for all. No, when we give our hearts to something or someone there is never a “done” is there? To begin to see what belief is to you and why it matters look at your life story. Take the time to remember moments in life when you might say things like, “But it wasn’t until I began”, “Something new comes along and I ask myself”, “I look back and see”, “I was challenged to” or “What I finally got was”. Has your answer to the opening question been woven into your life all along? Paying attention to the whole of our lives matters when we call our-selves believers. Have we been paying attention to the wrong things? Like a list of things we know for certain? When we give our whole heart belief will be seen in the moments of joy, fear, brokenness, wholeness, change and contentment. God has been whole heartedly present in your life. This might sound obvious but our churches haven’t been organized to work this way. The church has the mission to proclaim God’s love. How could such a mission be wrong? Look at the sentence again and highlight the actor/energy in it. The church becomes the actor/energy. For generations churches have been organized to receive people who want to join and become like us. The gifts of welcoming and teaching have served us well. Organized this way the church focused on what we offer that will draw people to us. The church has become inwardly focused on becoming what others want us to be. God’s mission has a church. What should the church’s response be? Asking, praying, studying and listening for God’s mission at this time and in this place. It is a change from being a magnet to being a guest in our neighborhood. In Luke 10 Jesus sends out 70 to all the villages he will visit. He didn’t tell them to go out and set up places where people could find them. Jesus said “Stay in one place, eating and drinking what they provide you. Don’t hesitate to accept hospitality..“ The believers were told to go and be guests. Believers learn how other people live. Would you rather be a host or a guest? Can our eyes be opened to God’s presence in strange, foreign places? Could learning how other people live, their struggles and dreams, their comforts, their point of view reveal God’s mission already there? The church is called to ask, pray, study and listen for the mission God is already doing and then jump in, join in God’s work all around us. I’d ask you to pray that Grace is renewed through that call. In May a gathering was scheduled to do just that. It was postponed because my mom’s death. It has been scheduled for Sunday, July 23 at 9am. Please join this conversation for an hour before worship that day. It won’t be the first and only gathering. More conversations will be scheduled in future months. Where is Our New Life? Following the traumatic events of the crucifixion and a terrifying resurrection, the disciples in their confusion and grief had to be wondering, What’s next? The bible readings for the Easter season provide the road map ahead as the disciples discover a new post resurrection life and reality: Christ is with us. Behind closed doors, in our doubt, on our journey, in water, bread, and wine. The Good Shepherd calls us to follow, going before us to prepare the way, bringing peace, breathing the Spirit on us, so that we may tell this story to people of every land and nation. Jesus’ promise to be with us is always the game changer. Today, how do we acknowledge Christ’s presence with us at Grace? Do we plan and participate as if we believe Christ is truly present with us? If not, what could we do differently? How can we make known Christ’s presence with us in our life together? I have seen a decrease in member participation/support at Grace. I believe this symptom demands that we seek new ways to enrich/expand our life as Christ’s living body. Certainly the Spiritual gifts home gatherings and the Wernecke Grace House fundraiser were high points for which we are thankful. Many people worked to organize these events and many people helped to make them happen. How can we build on these successes? Is the time right to look for opportunities to apply our spiritual gifts? I want to enrich/expand our participation and excitement at Grace. But we have to look at how we have been doing. In the past months there are few people signed up to assist with worship. More often than not I have helped the worship chairperson on Sunday mornings to cover the jobs that stand empty. As I write this Holy Week and Easter Sunday service have few people signed up to assist. Our average attendance at worship has decreased. Worship is not the only ministry that has less member participation and support. Adult education was stopped last fall when only 1 or 2 members attended. Our gatherings to share a meal continue to be a joy to attend but the number of people coming has dropped significantly. The Spring Clean-up was done by 6 people, the council chairperson and me. The council has had the same message to the congregation for the past 2 years; our ministry is not being supported financially. The past two budgets reflect less ministry, less. I’m not writing this to make you feel guilty. I write because we baptized are responsible to each other. At Easter our congregation needs Christ’s joy and new life. Please pray, talk, dream of how we will do this. The Pastor and council cannot do anything alone. I invite you to a time of prayer and dreaming on Tuesday, May 16th at 7 pm in the worship center. This will be a forward-looking event as we help one another think creatively about our future. We are Christ’s living body responsible to one another. Even in Texas we have the changing of seasons. We can have three different seasons in four days, but none the less, we have the changing of seasons. March and April, the spring months are many people’s favorite. The weather is warm but not yet stifling. The evenings cool which calms the spirit. Nature is bursting with growth, trees, plants and the Texas favorite, Bluebonnets! Around every corner beauty catches us by surprise. Why isn’t the New Year in the spring? I’d have to agree that this is my favorite season of the year. What changes do you make for spring? Maybe you’re able to open the windows and turn off the furnace. Some of us clean inside and outside our houses. Do you plant the garden? Are there projects around the house that can now be done? Once you’ve adjusted to the longer days can you enjoy the “extra” time you have in the evenings? What changes do you make for East-er? Do you come to worship expecting the beauty of the golden, colorful banners and songs of joy to sing? Can being with family and friends to celebrate lift your spirit? Are you stirred to offer praise to God through renewed prayer or service? The people of Grace have gathered to pray and seek out their Spiritual Gifts in the past months. Easter is the season to offer your gifts to the Holy Spirit to use in new ways. Can you trust the Spirit is in you and with Grace creating a new season in our ministry? Easter bursts in with gifts of light, joy and hope that I pray catch you by surprise. Is Lent a season that you want to avoid? Do you wish we could jump from Valentine’s Day to Easter? Do you have scary, sad or guilty memories about Lent? It is time to leave those feelings in the past. It’s time to open your heart to the deeply comforting and encouraging experience of Lent. It’s time you join the walk of Lent. We are God’s children. Baptism seals and marks us as Christ’s alone. Lent is being comforted by the One who made us a promise of eternal love. Lent is being encouraged by the Light that guides us to shine before others. Lent is a time to engage our minds, learning from those who have gone before us. I want to be a prayer partner in your Lenten walk. Throughout this season I’ll be calling to listen to your questions and prayers. Then together we will pray for our walk to be guided by Christ alone. Lent is a deeply comforting time. I want you to learn more about why and what we believe. Remember the Small Catechism? As Lutherans we have this gift to help us learn, no matter our age! If you haven’t thought about the Catechism since your confirmation day please open it again and let it guide your busy and complex adult self. The Wednesday services during Lent will open the Catechism to challenge and encourage you. Last month I wrote about opening our Spiritual gifts. The response has been wonderful. The Home Gatherings are filling up with an exciting spirit. We rejoice at the gatherings that God’s Spirit is with us and with our congregation. Spiritual gifts are: biblical; given to everyone; essential to discipleship; exciting to discover and reveal. Isn’t it a joy and comfort to hear that YOU are uniquely gifted for this time and place? Isn’t it amazing that YOU are linked with others here at Grace multiplying gifts for the mission of God? So we proclaim in worship that the Holy Spirit is the source and light of our congregation. Does that proclamation bring you strength? Does it jolt you a little? Are all gifts good? In the past week the council has told the congregation our financial need. The congregation has heard about the downward trend of giving that has reduced our ministries. That trend hasn’t changed so we now face the expected result of very little cash for any expense. It doesn’t feel joyful or amazing or like a gift at all. How can both be true? How can the Holy Spirit be in our midst stirring up gifts for mission and we are in such a financial hole? Shouldn’t the first insure the second never happens? Sometimes I feel like I’m moving be-tween two separate houses. One when I’m witnessing the joy and commitment of people at Grace and another when I hear about our inability to support this beloved congregation. I don’t have THE answer, only WE can be the answer. I do believe both can be true. God’s presence with us through the gifts that the Holy Spirit provides are ours, period. The gifts that we discover are for this time at Grace. Again, they are for this time at Grace. I believe it is not a coincidence that we are having these home gatherings to discover our gifts at the same time as we face a financial crossroads. No, God provides. God has provided these gatherings to reveal what is already here, already available, already strong, and already abundant in us for this mission that God has called us to be a part of. Remember Luther’s words? “I cannot by myself…” May those words bring relief to anyone who feels scared or sad about the current financial state or who wants to retreat from Grace because of it. It is a time to open our gifts to see what God has given, to rejoice that God provides and to commit to building up our congregation. Did you think you’d opened all your gifts? There are more to open! During January and February Grace members will host open houses for small groups to gather, discover and open their unique, God given gifts. Discovering whose we are includes discovering our spiritual gifts. Each one is given gifts by the Holy Spirit, gifts that shape who we are and how we function in the body of Christ. Dis-covering or recovering your spiritual gifts and exploring how you can better use them is part of growing in faith and life and discipleship at Grace and beyond. • exciting to discover and re-veal. Picture our bodies as gift boxes, entrusted to our care to open and share with our community. I know this might be too “outside of the box” for some of you. Please make the coura-geous move knowing that fel-low members as well as your Pastor need you there and will not push you beyond your comfort zone. Each gathering will help us to see each other as more than just a face in worship. I will lead a Bible study that will prepare us to assess our spiritual gifts. And there will be treats! More information is included in the article below. I’m blessed by all your gifts. May our gatherings open and cele-brate the multitude of gifts Grace has! Advent is the essential bridge that carries us to the Christmas celebration. We discover the words of Isaiah and other prophets whom God called to speak truth and promise to God’s people, even when they blatantly and destructively lived outside of their covenant with God. So powerful in message and beauty, the words of God’s prophets shine through the darkness of the people as well as through our darkness today that descends when we, God’s people, continue to stray from faithfulness to God. To approach Christmas only by way of the Advent Gospel readings will leave us ill-equipped to live in the post-Christmas world that is not all stars and angels, but is, in fact, rife with both destruction and possibility. We cannot take Advent and God’s coming among us to heart if we bypass the prophets. God’s people struggled mightily with faithfulness and faithlessness. Their struggle and lack of understanding often brought desperate consequences. Yet through arrogance, and wars, God’s prophets spoke to the people of a liberating future of joy, kindness, and peace…all made possible by God’s steadfast love born into the world. When we allow God’s prophets to speak a word to us, alongside those of the Gospel writers, we discover this glorious gift in the manger: Because of the darkness, the Light comes to us. Do you have days when you need to look at the big picture? Maybe you’ve found yourself deep among the trees and needed a map to get out far enough to see the whole forest. I know that feeling. Sometimes it comes when I’m feeling sorry for myself and then hear about some-one in real physical need. Or when I’m working on a project and end up being drawn into the smallest details for hours at a time. Lately I feel this way when I hear about natural disasters, terrorist actions, wars, threatening political speech, failed government agencies that care for children and countless illnesses that burden families. Feel the darkness, the hopelessness among the trees? What are we to do? Make ourselves numb to it all? Believe there is nothing to be done and throw our hands in the air? I’ve done both, how about you? November brings many opportunities for us to look at the big picture. November 6th is All Saints Day. We will gather to remember that we are part of God’s Kingdom. It is a realm that extends beyond this life. It is a realm that has provided centuries of people walking in our shoes living faithful lives. The image of a great cloud of witnesses surrounding and rooting for us has always been a favorite of mine. All Saints is a celebration of God’s faithfulness to our baptismal promise that we are God’s own forever. Out of the chaos of this election season we will have our say. Within days of the election we honor Veterans, citizens who serve not themselves but the greater good. It will be a week that America can be at its best. The church year ends on November 20th with Christ the King Sunday. It reminds us that any nation is limited, that no leader is eternal. Our celebration will lay before us the scope of God’s eternal story of salvation not just for one nation, time or race but for all creation. This big picture is one to contemplate for a lifetime. Thanksgiving comes to remind us of our blessings. Not the blessing of being too full or lucky enough to be a fortunate one but the blessing of dependency. We are not alone but connected to creation that nurtures us in ways beyond a full belly. Do you need to hear, receive and experience God’s big picture? It is here in worship, fellowship and service throughout November. A 500 Year Old Book, for Real? In her report to the 2016 Evangelical Lutheran Church in America (ELCA) Churchwide Assembly, ELCA Presiding Bishop Elizabeth A. Eaton reflected on the ELCA’s work over the past three years and lifted up future priorities for the church. Eaton said much of her focus the past three years has been on the “how and why we do this work,” reminding the assembly of her four emphases for this church: We are church. We are Lutheran. We are church together. We are church for the sake of the world. In an effort to focus on theology as that which defines and unifies all Lutherans, Eaton told the assembly she is calling this church to read the small catechism together from now until October 2017. When was the last time you thought about the Small Catechism? Perhaps you’ve never heard of it. If you were raised in the Lutheran church you probably used it in confirmation classes. It was written by Martin Luther in 1529 as a teacher’s guide for beleaguered parents. Even five centuries ago it was known that parents are the first and best teachers for their children. Let’s answer Bishop Eaton’s call to return to this 500 year old gift and let it open our lives a new. 57.9% of all American (not just ELCA) congregations have less than 100 people worshipping on a weekend. Does that surprise you? I’ve been reading “American Congregations 2015: Thriving and Surviving” from the Hartford Institute for Religion Research. It is the fifth survey in a series beginning in 2000 and continuing 2005, 2008 and 2010. The report highlights signs of hope seen in innovation, growth and positive change in very small churches. In times when over half of small congregations don’t see themselves as thriving what can be done? Change. Congregations that are willing to “change to meet new challenges” become more vital and energized. Hope thrives where change is welcome. “Thriving congregations are nearly ten times (!) more likely to have changed themselves than are struggling congregations.” Does that sound scary or exciting to you? Maybe you feel both. Most of us don’t want to change because it always, always causes tensions and conflicts. The report found that vitality grows out of successfully managing conflict but keeping it from becoming serious. Last January 25 members of Grace completed a survey from the ELCA on congregational vitality. The results showed that we are doing a lot of things well like; “worship that nurture people’s faith, we build strong, healthy relationships and we are a positive force in the community”. I am not surprised by this list, are you? I have said before that Grace has praise, care and giving built into its DNA. It is important that these characteristics continue to be nurtured. More than half of the people felt “only some” excitement about our future and that we are not really willing to try new things. These are both obstacles for going forward as a vital, energized congregation. What are we going to do? Pray for courage and vision. Give thanks for all the ways Grace shines and builds up the Kingdom of God. Join with other small congregations to face the future with excitement. Be a part of “Mission: Small Church Exploration”. This is a gathering of churches in the Capital North Conference of our synod. Gathering three times, August 28 from 2-5p, September 17 from 1-4p and October 15 from 1-4p at St. Peter’s in Elgin we will work together toward vitality. Sign up to go or talk to me. Grace’s future is strong. Become engaged and invested. It has been a busy year. I’ve heard folks say they can’t believe its June already! 2016 is close to half over and what have we done? Well, a lot really. Lent was early this year. It began before Valentine’s Day, on Feb. 10. Here at Grace we observed Lent with worship services and a special offering for ELCA World Hunger of over $1500. It was added to the Synod wide offering of over $106,000! We had a wonderful Easter Day at the end of March. The choirs provided music that opened our hearts to the joy of new life connected in Christ. Our congregation studied and then responded to a Stewardship drive in April asking us to recommit our whole lives to Christ through Grace’s ministries. We heard how God has provided us with gifts to produce more than we can imagine. We named our gifts and gave them to this great task. In May we celebrated and then celebrated some more! It began with the Wernecke Grace House dedication then the Sunday school leaders and musicians thanksgiving and because we had more time, on the fifth Sunday we had a fun potluck. And the year isn’t even half over! I write this musing because summer comes and you might feel like you need to catch your breath. On the one hand I say “You deserve a break. Thank you for all you’ve done.” On the other hand I’m reminding you, encouraging you to see how we are participating in God’s mission. We aren’t just checking items off a “to do” list, we are praying for God to direct and empower this ministry in this place at this time for all people. Summer time comes and we are fed with stories unique to Luke. We will hear of God’s healing and reconciling power given to all people. We receive stories of healing, forgiveness, and new life and taste the power of these stories at the altar. How can we take a break from that? Where else can we breathe in and be made new? If you feel like you need to take a breath this summer I’m calling you to worship and mission right here at Grace. Connected in Christ for GOOD! Our Stewardship program this month is rooted in the “Annual Roadmap” the council has set before the congregation as a vision for ministry. The three weekly themes are drawn from the values that will guide us this year; “Seek out and use gifts of all ages”,” Excitement about the congregation’s future”, “Interact with the local community” and “Worship nurtures faith”. Let me help make that connection between these values and our Stewardship program. Our program will begin with “Connected in Christ through worship”. It is in worship that we lay our burdens down. The burdens of the “me first” world which cause such disease living as, “There is never enough”, “I’m not good enough” and “I’m in this alone.” All this leads to feeling exhausted, fearful and isolated. In worship we have a place to lay that down and be free! Connected in Christ gives us a way of life that enlivens and encourages abundant living. The second week will be “Connected in Christ by our gifts”. Can you see the intersection between the freedom given in worship and celebrating our gifts? How can we see ourselves as gifted people if we are living as servants to the “me first” world? First, God gives us the gift of freedom, then opens our eyes to the gifts we have to offer. On this Sunday we will be witnesses to how our gift is multiplied through this connection in Christ. The final week is a celebration! “Connected in Christ for GOOD!” is an exclamation with multiple meanings. We discover that our connection in Christ with each other is good for me. It provides comfort and accountability, it roots me in a gifted life, free of “me first” burdens. We discover that our connection in Christ with each other is good for God’s world. My life does good and points to God in the world. We discover that our connection in Christ with each other is for the long haul. The Christian communion is a deep rooted, centuries old, worldwide life for good. What a relief to let go of isolated living. The leadership of our congregation has laid out a road map for our year. The theme is “Connected in Christ” from John’s image of the vine and the branches. I am proud to serve with these leaders who exemplify Grace’s values and who have chosen hope. I’d like to hear from you. I’d like to talk to you. It doesn’t matter how long you’ve been at Grace or if you’re a member, let’s talk. ♦ What makes us unique? ♦ What have we done well in the past two years? ♦ What stories have you shared about Grace with family and friends? ♦ What would other people say about Grace? ♦ How would you reframe a challenge you see at Grace to become an opportunity? I’m excited about the mission we are called to this year. I’m excited to hear from you. Lent has been a time for less. The church has painted Lent as a dark, sad and empty time. These images have turned people away from discovering what Lent can really be for believers. If this has happened to you, would you give Lent another chance to teach you how God is alive in your life? This year Grace will hold five Wednesday evening services that use the image of opening for Lent. Yes, opening, not less and smaller. Opening our eyes, ears, hands, hearts and lives to God’s abundant presence. We will pray for open eyes for vision of how to let God into our daily lives so that we can be changed. We will pray that when we ask questions, we don’t already think we know the answers, but instead can listen for understanding. We will pray for hands eager to create community among our neighbors. We will pray for hearts that connect us with all God has created; all of nature and all of your people. We will pray for abundant lives, gifts from God. Living simply, living generously. This Lent be open to all the abundant life God has for you. Come and see! January brings so much new with it. In church we begin the Epiphany journey. It is a time for revealing Jesus as God’s own. In John 1 we hear that “it is God the only Son, who is close to the Father’s heart, who has made God known.” Making God known is the Epiphany journey. In worship we will begin the journey as we hear about God in flesh made manifest (revealed, known) by a star, in Jordan’s stream at his baptism and at the wedding feast at Cana. These events in Jesus’ life affirm our hope in the promises that might sound too good, that “all flesh shall see the salvation of God” (Luke 3:6). It is a time to reaffirm our hope in the promises that are not too good to be true, promises of all the good things that God is always working to bring into our lives. We are on a journey. Notice I said “we”. Yes we make God known. We need each other’s guidance, encouragement, creativity and balance. I hope it will be a year where we all dare to use our imaginations a little more, recommit our involvement a little more and become changed by all that is revealed to us. Grace Lutheran is filled with nice people doing nice things for themselves and others. Visitors and new members comment on how nice it is to visit a church that welcomes them. I’ve been thinking about what is next for Grace. What is needed for this welcoming, serving, caring community to grow? I’ve thought about the ministries that enrich members and friends alike. I’ve watched as dozens of members spend hours working to help Grace shine as a welcoming place. I’ve listened to stories of how support from Grace has meant everything during hard times. With all these wonderful things happening already, do I need to think about what’s next? An article in the July Lutheran Magazine, “Nice is not enough.” helped me with my question. The author acknowledges that being nice and doing nice things does matter. What matters more is that our congregations are recognized as places where God is central. As people search for meaning and direction for their lives they look for places where people are growing into such lives. It is a stirring article. What’s next for Grace? More of the same would be enough. Changing what we do isn’t necessary, it’s good. I don’t think a new service project is what Grace needs next. Service will continue to be our strength. I think growing in faith through prayer, worship and Bible study will sharpen the focus of everything Grace does. Seeing God in this place and sharing that vibrant faith with others is our purpose. Will you join me in this next step? Is being a nice place to come enough or are there plenty of nice places for folks to gather already? “Claimed, Gathered, Sent” is a resource that asks, “Does being church matter?” In September this resource will be used in worship and as an adult study. I look forward to growing in faith with you as we ask what comes next for Grace. The church year has festivals, seasons, and time. Half the year has been filled with Advent, Christmas, Epiphany, Lent, Easter, and Pentecost. Yes, it has been six months since Advent began. Now we begin six months of “Ordinary time”. You may notice that the altar hangings remain green for a long time; that’s ordinary time. It doesn’t sound too eventful does it? It doesn’t have any special Hallmark cards or ornament. There aren’t any cake receptions for ordinary time. What good can come from the ordinary? It sounds a lot like average, and most of us don’t care to be average at all. The old Lutheran line is that we are above average. I think the hidden gem in ordinary time is how it works deep in us forming habits. Have you ever had to practice an instrument or sport? It is during these ordinary practices that our habits are formed. We learn deep in our bones how to hold the instrument or equipment, how to use our whole body to play and essentials become automatic. Ordinary time is teaching time. In worship we will hear Jesus’ teachings and see his day to day life during this Ordinary Time. Can paying attention to our teacher’s practices help us form our own habits? Faith is formed much like any other practice, by taking time to let it shape you. The Christian practices of prayer, bible reading and service can be strengthened during this ordinary time. We can learn to hold these practices so that they feel like an ordinary part of our lives. They can become an automatic response to stress, fear and anger. We enter Ordinary Time expecting that habits energize our future so by practicing we are shaped, bone deep to be Jesus’ followers. How do you take time away? What comes to mind are vacations as time away. Are there other examples of taking time away? I have a friend that considers her back porch as time away. She says when she steps out on her porch she feels relaxed and far from her cares. Perhaps you have such a place close by that feels like you are taking time away. I find reading fiction can make the time melt away. Do you have a hobby that you enjoy? For many people taking time for hobbies: to build, play or cook is a wonderful experience of time away. As believers we have opportunities throughout the day to pray and read scripture that takes time and places it in God’s hands. This summer I’ll be taking time away as vacation and education. I love my family and having extended time to spend with them refreshes and delights me. Can you believe there are 35 people in my immediate family? We grew by one at Christmas and two since Christmas! I am very excited to meet and snuggle these newest family babies. My friend Sue joins the family during this vacation. Mom, Sue ,and I find fun things to do that we just wouldn’t do unless it was time away. For the second year I’ll attend the Luther Academy of the Rockies at Meeker Park, just outside Rocky Mountain National Park. This is one of the longest running continuing education events in the country, celebrating its 45th year. There are three faculty members: Martin Lohrmann, an historian, Jan Schnell Rippentrop, a preaching professor, and Robert Albers, a pastoral care professor. We will hear about Reformation-era documents that remain lively resources for Christian ministry and mission today. We will be reminded that the power of the Holy Spirit stirs people to be active in the in-breaking of God’s future. We will consider our own pastoral identity as a servant leader among God’s people. Time away is time filled with newness, rest, love, and inspiration. Thank you for including time away as a benefit for this pastor. I am very thankful. “What did you learn today?” we ask children. When was the last time you were asked that question? Do adults learn, day by day? Does the longing to learn fade with age? A faithful life can stir that longing and ignite a desire to know more and more about God’s encompassing love. We are surrounded by God’s presence and actions. Where do you see God in your world? What questions do you have once you see God at work? When have you been on the receiving and sharing sides of God’s activity in the world? I listen to first graders read. I am delighted to hear kids grow in their reading skills throughout the year. A few months ago one student started to read a book and said, “This is too hard. I’ll read another one.” I asked him to read just one more page, he did it. Now, months later he giggles as he reads, surprised and wanting me to be surprised by the story too. He is my teacher, encouraging me to keep going when I think it is too hard. My mother has been my teacher throughout my life. Have you had a mother or a mothering presence in your life to direct, protect and redirect your learning? Mother’s day is about many gifts that mothers give. I’d like to bless and praise mothers for stirring a longing to grow and become who God imagines us to be. Like the Hubble a mother can show us wonders beyond our imaginings and point us to discover more for ourselves. Grace is blessed to have teachers that are also faithful students. This month we thank the Sunday school leaders and teachers for igniting God’s story of love in our children. The Sunday school ministry teaches stories from the bible so that the child might see themselves in God’s story. A seed is planted that can grow into a lifetime of longing to know more and more about God. Thank you and bless you Sunday school leaders! What did you learn today? It is a question we can celebrate answering faithfully. Believers gather to hear the old, old story of Jesus’ proclamation; “God’s reign is for all and forever!” What Good News! What next? This Easter morning the old, old story is put into our hearts and hands. When we hear that God’s community is ours to share in and to extend, what do we do? All around us the reign of power and privilege continues to rule. Decisions are made by the most powerful to continue investing in security through armaments. We are made into the product by companies that profit from our likes. Fear is instilled in every aspect of our lives: beware, and watch out. It’s no wonder that, just like the witnesses of old, our dreams become dim and break. What next? We are raised up. We are made new. We taste the proclamation anew; “God’s reign is for all and forever!” Our broken dreams are linked to God’s community where we witness investing in security through relationships, where our worth flows from God’s own breath, where the Light of the world accompanies us into fearful places. Where the question “What next?” is answered by hearts and hands extended. God’s reign is for all and forever! Throughout this Lenten season we will hear the promises God makes to the faithful from Abraham and Sarah to you and me. The first book of the Bible, Genesis has a promise in almost every chapter from 12-24. Can a promise strengthen or help us in our daily lives? Let’s begin by thinking about promises you have made. Perhaps you promised to be somewhere at a certain time, or to remember an important date, or that next time it will be different. Maybe you promised someone to be their spouse, faithful and true. Can a promise help or strengthen us in our daily lives? Many of our promises are to someone else; a promise based on a relationship, saying, “You know me, I promise to…” behind our promises. Our relationships can strengthen us. We depend on others and they depend on us. relationship. These promises are made before anyone can prove themselves to God. After making a promise to Abraham and Sarah they would have a child both fell to the ground laughing. They were100 years old, you see. Imagine laughing at God’s promise? God replies, “Is anything too wonderful for the Lord?” Promises strengthen and direct our lives. In our relationships with others we respond to promises with faithfulness. We make changes in schedules, expectations, and even our hopes and dreams because of promisefilled relationships. We know the back and forth that goes with trying and failing to keep promises. Is it OK that we try and fail at holding onto God’s promises to us? We try and fail, God holds true. Remember, we receive God’s promise; we aren’t the one making the promise. God’s gift of faith is whole. God promises to lead us to new life, that doesn’t change. Lent is a season of forty days, from Ash Wednesday to Holy Saturday, the day before Easter. Because Sundays celebrate Jesus’ resurrection, they are not included in the forty days. In the Bible, the number forty appears in the story of the flood, in Israel’s wandering in the wilderness and in the life of Jesus. The number forty is often a symbol of ruin and renewal, testing and teaching. “The flood continued forty days on the earth. The waters increased and bore up the ark” (Gen. 7:17). As the flood covered the earth and lifted up the ark, saving those within, so in baptism we die to sin and are raised to new life in Christ. Lent is a time to walk in newness of life. “The LORD your God has led you these forty years in the wilderness, that he might humble you, testing you to know what was in your heart” (Deut. 8:2). Lent is a season of humility and repentance, as we turn to the Lord and seek his forgiveness. Lent is a time to forgive others as we have been forgiven. “He presented himself alive to them after his suffering by many proofs, appearing to them during forty days and speaking about the kingdom of God” (Acts 1:3). The risen Lord appeared repeatedly to his disciples and taught them about the kingdom, preparing them to be his witnesses. Lent is a time to be witnesses for Jesus, to tell others of the forgiveness and life found in Him. Let us walk in newness of life, forgiving and witnessing to Jesus! The message of the angel’s song, “Glory to God in the highest heaven!” continues to ring throughout Epiphany. The star that the wise men followed continues to call us to follow and see what God has done. Christmas fades in our world so quickly. The trees are down and gifts returned within days of the celebration. We can feel relieved that we got through another Christmas. At church the twelve days of Christmas lead us into weeks of living under the Epiphany star. During January and February watch the star shine in our worship services. Throughout this season we will place symbols from scripture under the star as a reminder of our lives lived under God’s light and direction. First to come under this star are the Wise Men. They have diligently searched; believing that what they find will redirect their lives for good. What wonderful models for us follow. Next is the Baptismal font. Jesus begins his ministry by being baptized. Our baptisms mark us as children of God. We walk in the light of Jesus. Next we hear the invitation to “Follow me.” These words invoke feelings of unworthiness in us but Jesus calls and calls again. Come and join Him by inviting others under the Epiphany light. As the season continues we will include a celebration of Christian unity, breaking through barriers that separate us and words of healing. Come and see. The angel’s song drifts on and on, “Glory to God in the highest.” The light of that holy night shines on and on, for us, in us and with us. Are you the kind of person that has the future in hand? You have scheduled, organized, and are prepared for any likelihood. Or are you the kind of person that knows some preparation would be good, but just didn’t get around to it? Or are you the kind of person that prepares but it always seems like your preparations are too little, too late? happiness can be found, at a price. No matter what type of person you are, Advent is a respite. This short little season of the Church year is like a friend taking us aside for a rest, a breath. “Come with me and find comfort and calm.” Advent turns us from anxiety to thoughtfulness; from hectic to focused time apart. November is always connected to Thanksgiving. You might have wonderful memories of Thanksgivings past. I can smell the mix of turkey cooking, pumpkin pie and yeast rolls fresh from the oven as I walked into Grandma and Grandpa’s house. Thanksgiving Day has been a time to stop and remember that we have many things and people to be thankful for in our lives. What if thanksgiving could be extended throughout the month of November? What if we could gather again and again to remember that we are a thanks giving people? That is what we are going to do this November at Grace. We are going to extend thanksgiving for weeks! Thanksgiving and remembering go together for me. My memories include loved ones that have died. November 2nd is All Saints’ Day. It is a day to be thankful for those who have gone before us, who have loved us, who have been faithful and given us faith to build on for the future. Later in the month our country remembers and gives thanks to veterans for their service and sacrifice. Worship on November 2nd will include remembrance prayers and candles. You are invited to bring a picture or a remembrance of one you are giving thanks for their presence in your life. A table will be set at the front of the church for all our remembrances. Christ the King Sunday draws our wondering faith back to the One in whom we exist. We remember how throughout the year we have gathered to hear the story of God’s love given in Jesus. This month we also meet as a congregation to decide on leadership and support for Grace. Our Annual Meeting is on November 23rd. At this meeting we will celebrate Grace’s 35th Anniversary as a congregation. Imagine all those who came together to pray for Grace and all those who have been worshiping, serving, and growing in friendships over these 35 years. Our celebration of Thanksgiving Day will begin on the Sunday before with a community worship service at The Baptist Children’s Home chapel. More details are on page 2. The feast begins the night before with a congregational Thanksgiving dinner here at Grace. It is a fun and fulfilling, overfilling, feast with the Grace family. There is one more opportunity to celebrate this day of “more and more”. A community dinner will be held at the St. William parish hall, “Annie’s Way”. Meals will be served there and over 700 meals will be delivered to those in need in Round Rock. Read more details on page 2. Our month of thanksgiving concludes with the First Sunday in Advent on November 30th. Even with all that is packed into this month we look to the future and give thanks for the One who is to come, Emmanuel, God with us. We are a thanks giving people. Celebrate at Grace during this Thanksgiving month! What makes a church a church? Is it a web site? Or a building? Or a paid ministry professional? Or a full listing of programs available? This past summer I attended a two week event in Colorado that asked that question. It was a very exciting conversation with a New Testament professor from Wartburg seminary, a Historian from Trinity seminary and 40 church professionals. This month I’ll preach a two week series from Acts that focuses our attention on the heartbeat of who we are. There are times in our church life that we go from event to event, job to job, offering to offering. It can become a duty filled experience. I’ve heard from members of congregations that I’ve served say I was tired so I stopped coming. Visitors I’ve talked to have said they chose larger congregations because they wanted to be anonymous in church. What makes a church needs to be lifted up so that what we are drawn to is the main thing. Our heartbeat is Spirited. It is the Lord’s doing in Acts. The community had characteristics that set them apart from other groups. They were a community of fellowship, worship and prayer. They were devoted to Jesus’ teaching and telling the story. They took risks because of their faith in the Spirit’s leading. Do you recognize some of these characteristics at Grace? Our October series will highlight Acts 2: 42-47 and Acts 11. Take some time to read these Bible stories and consider what the heartbeat of church is for you. I was reviewing the September calendar for the Graceline and found there were six Wednesdays in the month. Is that right? No it’s not; the calendar had repeated a week to add the extra days. As I looked at everything happening during September I’m longing for that extra week. Isn’t that a great problem to have? Grace is filled to overflowing. Here are some of the highlights. Grace joins the other 10,000 congregations of the ELCA in a God’s Work Our Hands Sunday. This is the third time the congregation has focused our entire Sunday schedule on service outside these walls. It will be a day of fun as we work together helping and serving. Rally Sunday will be extra special with a focus on God’s Global Barnyard. To bring that focus alive we will have pigs, chicks, and other baby animals here to pet. The Sunday School will also have time for a bible story, crafts and games. We welcome Charlotte Reemts as the new superintendent of the Sunday school. We also welcome Emily Saccone as the new infant teacher. Emily will have stories for the youngest among us; the 1-2 year olds will meet in the nursery. God’s Global Barnyard will extend throughout the fall as we collect an offering to buy animals for people around the world. On Rally Sunday our confirmation class will meet for the first time. We have four students in the class. I’m very excited to begin this journey of affirming their faith. Grace is a community where all are included. This is witnessed in our service Sundays where all ages can participate. It is also seen in worship where acolytes share in leading. On September 7th we will train new acolytes to join in leading and serving. Pastor Dalkle will lead a Men’sBible Study on September 15th at 1p.m. following the Lunch Bunch. This study will look at the book of signs that point to glorifying God. The choir has begun rehearsals. A new instrument has been added: hand chimes. These will add to the already wonderful music Grace is blessed with throughout the year. May the Spirit that has stirred all this be our joy and guide into this very exciting month. On Pentecost prayers were offered by writing them on a red piece of cloth. Following a community prayer those pieces of cloth were wrapped around the cross. Those prayers were for the Spirit’s stirring ministries at Grace. Thank you for your prayers. I’ve been blessed by reading these prayers. I wasn’t surprised by the number of thanksgiving prayers. Prayers giving thanks that Grace has been a loving and accepting community is a foundation for all ministries. Perhaps it was these gifts of the Spirit that drew you into fellowship. I have been the recipient of these gifts. Let me tell you a secret, pastors know that congregations have to put up with all their odd ways. What isn’t a secret is that not all congregations are loving and accepting of pastor’s odd ways. I guess these gifts are the essentials of God’s grace. “Stir up in us the openness to be your grace always!” Prayers for blessings, hope and love, boldness and fun capture the “feel “of Grace. Without the blessing, hope and love boldness withers. When there is a stirring of all of these gifts new ideas and challenges can be faced and met. These prayers really get to what I call the DNA of the fellowship, service.